Jennifer Murch: a weekend away, soiree! As is the custom, we kicked off the weekend with a feast: melt-in-your-mouth beef tenderloin, Bloody Marys, an amazing Caesar salad with candied orange slices (I know!!! ), and salted chocolate caramel tart. Oh, and the soup had a whole dried hibiscus flower floating in the center, delish. 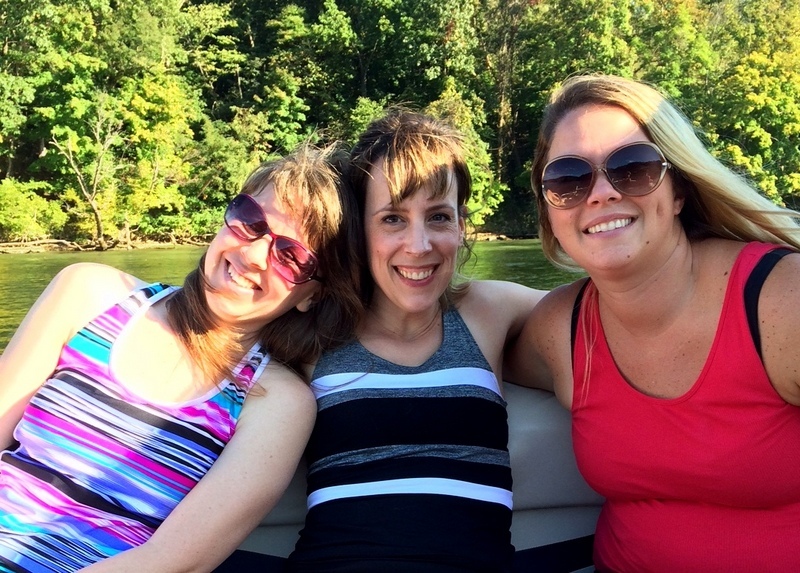 For the afternoon’s entertainment, my aunt rented a pontoon and we boated up and down Cheat Lake. At one point we cast anchor (or whatever you call it) so we could swim. I wanted to get in, and I was already wearing my swimsuit, but all that murky, dark water kind of freaked me out. Who knew what was lurking just below the surface, waiting to grab my feet? Plus, I’d washed my hair that morning. It’d be so much easier to just sit prettily on the pontoon. But then my sister-in-law hurled herself into the deep, dark lake, and then my cousin-in-law followed suit. Far too often in life, I’ve refrained from physical adventure, not wanting to deal with the mess and dirt, but that afternoon, I decided, no more wall-flowering. I was on a pontoon in the middle of a gorgeous lake on a brilliant fall afternoon, for crying out loud. GET IN THE WATER ALREADY, JENNIFER. And so in I jumped and it was marvelous. Normally, deep water makes me feel like I might be drowning (because I might be! ), but this time, for some reason, I was completely relaxed. Maybe because there was no pool side to grab onto? Maybe because the lake water contained some sort of mineral that created buoyancy? 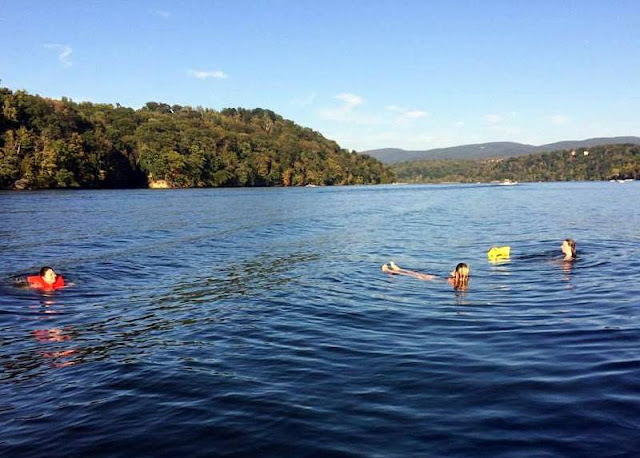 In any case, my cousin-in-law and I (my sister-in-law had already gotten out) just hung out there in the middle of the lake, treading water and visiting. When I got tired, I’d stretch out on my back and relax, like I was on my living room couch. From the pontoon, the rest of the gang kept an eye on us, making sure we didn’t float too far away or get run over by passing speed boats, and after a half hour (forty-five minutes?) of water therapy, it was time to move on. That evening we ate dinner at a restaurant that had the best garlic cream sauce. (I’d ordered charcuterie, but then I ate everyone else’s food, too. Perks of swimming!) And then we went home and sat around the fire pit and drank red wine and coffee and told stories. The next morning we had coffee in the sunroom, followed by brunch. One of the topics of discussion: my aunt's killer legs. She took a self portrait when she was young (and no longer a plain Mennonite, obviously) and now the photo hangs in her bedroom. My aunt surprised me with a birthday present (my birthday was the next day): a crazy-heavy, solid marble rolling pin. And then everyone else was like, Hey, no fair! I want the soiree to be held on my birthday! But then, as is her custom, my aunt gave everyone a present. So perfect. Wearing it gives me an emotional kick-in-the-pants. Before leaving, we took some parting group shots. look at my mother — isn't she glam? This same time, years previous: peanut butter fudge, the quotidian (10.13.14), home, roasted red pepper soup, pepperoni rolls, sweet onion corn bake, pumpkin cake with cream cheese frosting. This always makes me so happy! And the tiniest bit jealous, but shhhh. This makes me SO envious, Jennifer! What a special tradition, but then your family seems to have many good ones. You and your mother and your aunt look just alike in these pictures! I love that necklace. I may have to hunt one up. Could you please share where your lovely aunt found the necklaces? I love them and would love to get one for myself and the other awesome women in my life. Chocolate and Steel, on Etsy.